Many of us have experienced a headache at one point or another. 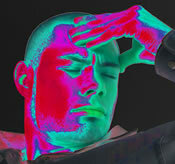 Headaches can make people feel handicapped, restricting in performing everyday routine activities. With chronic and recurrent headaches, It can sometimes feel like no one understands the effect headaches have on people’s lives. Many of us tend to restrict our recreational activity, reducing sport and hobbies when our headaches are bad. The pain and discomfort from headaches can make us feel angry, leaving us feeling vulnerable, less likely to socialise and more likely to reach for pain killers. Over time, headaches can detrimentally affect our outlook on life, making us afraid to go outside, leaving us feeling desperate for help and some relief. Sometimes we can feel like we are paying penalties at work, or at home because of headaches. Having to work with a headache or take breaks can negatively impact work productivity making us more likely to phone in sick. Relationships with family and friends can be placed under stress and as a result, we can avoid being around people when we have a headache. Headaches are confusing, frustrating and reduce our ability to concentrate properly. We can feel tension like a band behind the back of the head, behind one eye or in the forehead. We can become photosensitive to light, needing to seek a darkened room away from brightness to get relief from headaches. Sometimes a headache can affect our vision with symptoms including “dot dash”, waterfalls’, “flashing lights” and other things with an aura or prodrome. Sometimes headaches can be triggered by different sensations, a smell, a sound, or certain foods like nuts, dairy, red wine and chocolates. Massage relief for headaches can focus on techniques to decrease muscle tension, improve muscle stretch and improve joint movement. Massage therapy for headaches can help improve circulation of blood to the area undergoing massage therapy and push out toxins and waste products of metabolism. Chiropractic treatment for headaches includes Chiropractic adjustments, where a Chiropractor uses their hands to manually manipulate a segment of the spine back to its proper alignment, therefore “freeing” up the joint restriction. Chiropractic treatment for headaches helps increase joint motion, decreases muscle spasm and helps restore normal joint function. Physiotherapy treatment for headaches effectively uses soft tissue therapy principles and techniques to free up the tightness in the muscles and joints around the neck and head. Physiotherapists also use therapeutic ultrasound in treatment for headaches, applying sonar sound waves to the soft tissue around the neck to relieve tension.